One of the best things I’ve been asked to do this year (so far!) is to work with one of Bangor’s longest established butchers to help develop recipes for their new range of ‘gourmet’ sausages. I like sausages a lot. 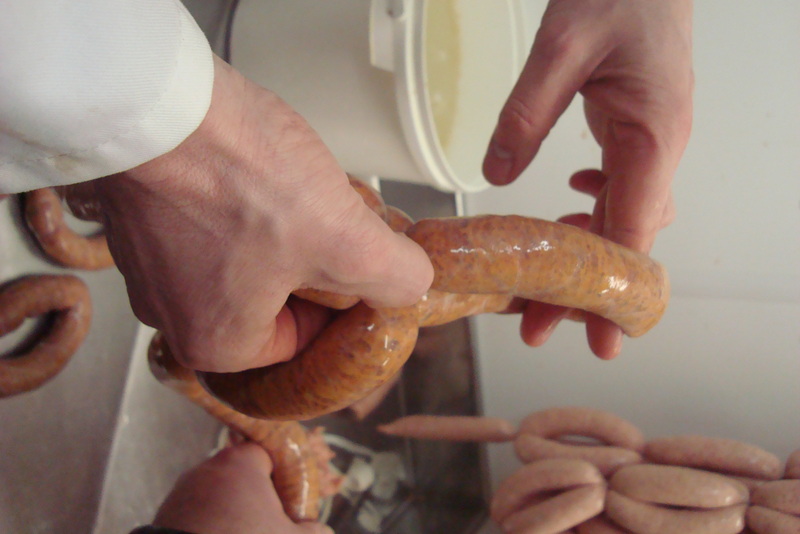 In particular I like well made, high quality British sausages and fancy sausages…from Merguez lamb, to pork with caramelised onion, anything with apple and herbs, French toulouse…seriously, I love them all! Down at the butchers our first attempt was to create a good quality cooking chorizo. For those that don’t know chorizo is a type of European sausage made with pork, sweet and smoked paprika and salt, plus various additions such as herbs, wine and cayenne or hot peppers. 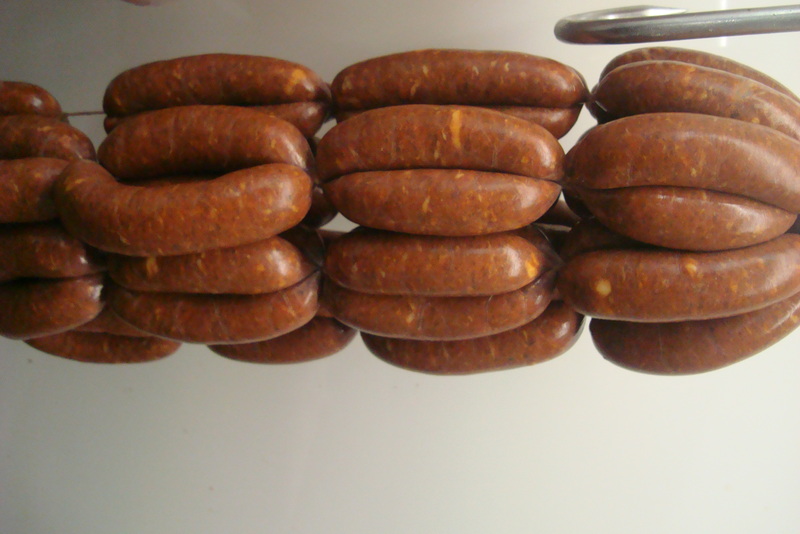 Spanish and Portuguese chorizo is generally fermented, cured and smoked and is either sweet or picante (hot). 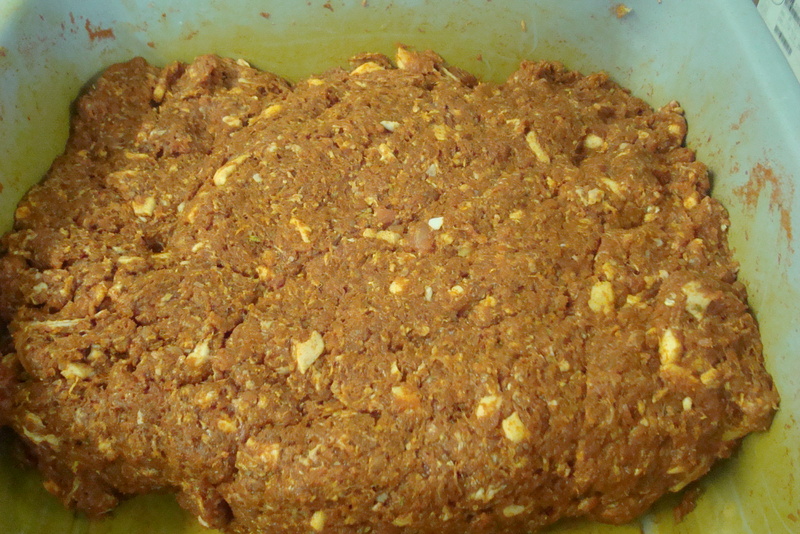 This type of chorizo does not need cooking although you can add it to various dishes. 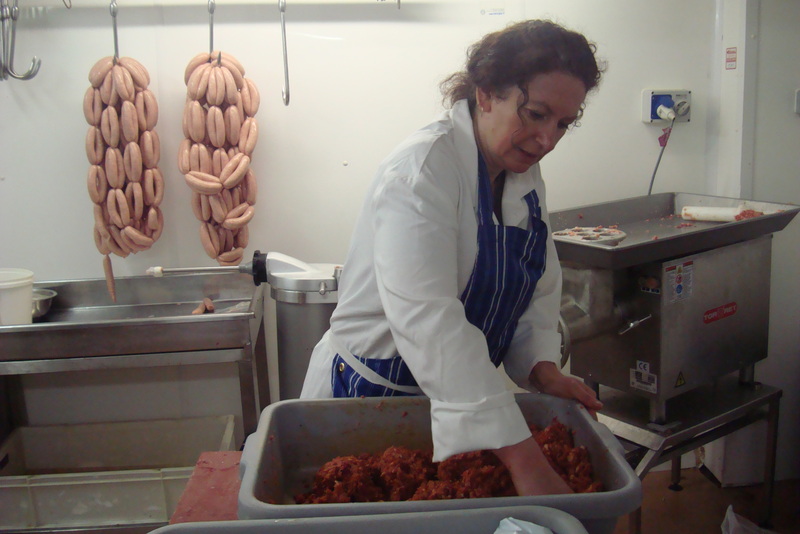 My favourite type of chorizo is the uncooked kind, which is just like a sausage but a little firmer and dryer. 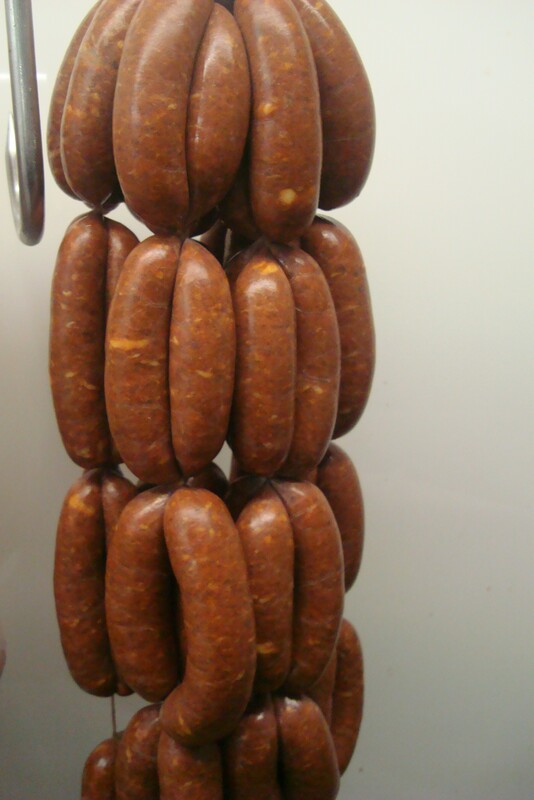 I have asked the butchers for ‘proper’ cooking chorizo plenty of times so what better place to begin with our gourmet sausage range than to make us some Welsh chorizo. On Wednesday, armed with my spice box I trundled off to Bangor. Appropriately (but none too elegantly) dressed in white coat and apron, Johnathan and I set to work. 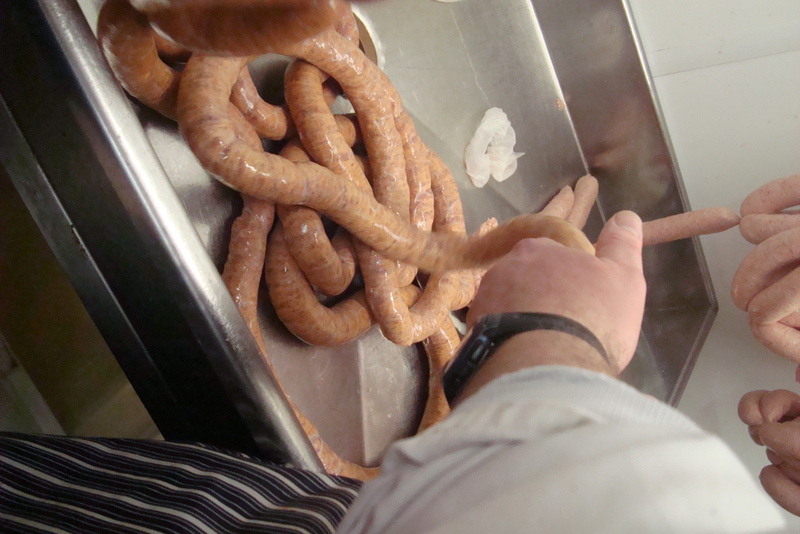 Sausage making is as I discovered, quite an art form. The ingredients must be measured very accurately (not like my usual we need ‘just about’ this amount), otherwise the flavours change too much, particularly the salt content which needs to be exactly 2.2% of the combined weight of meat and fat. Having measured the required amount of ingredients….sorry I cannot divulge the recipe, it’s a secret…we got stuck in with mixing and kneading the ingredients together. 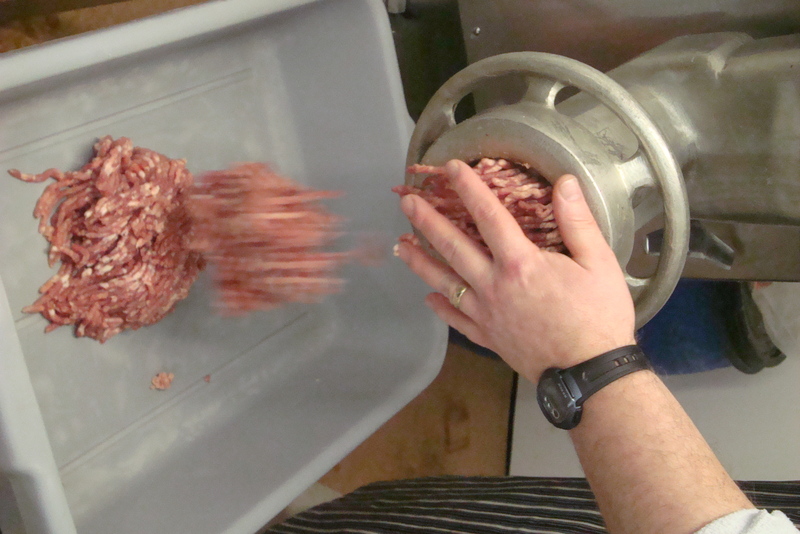 and what we were left with was a deep red highly aromatic meat which had stained everything from the bowl to my hands! We made up a small patty to fry on the griddle, just to test the flavours and spices. Although the flavour will have changed considerably by the time they go on sale. 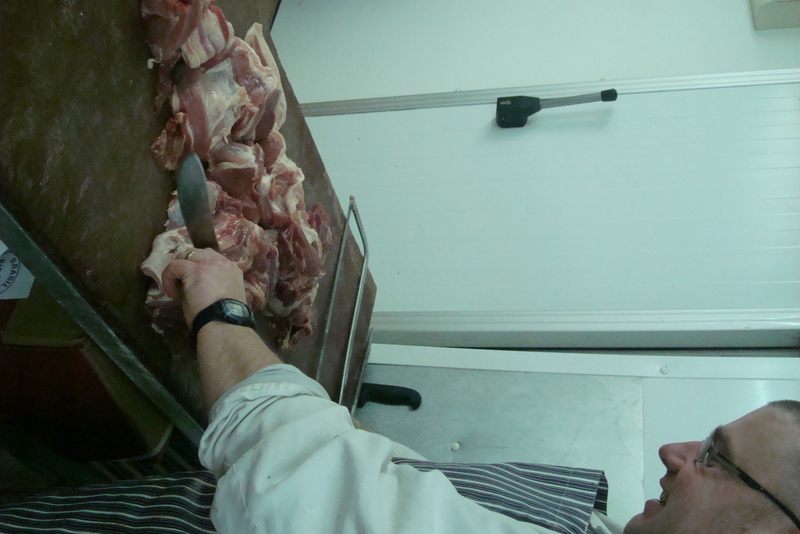 Next Paul attempted to teach me how to twist and pinch the sausages. I was all fingers and thumbs and took ages unlike the professionals. They made it look so easy! The sausages were then hung to dry for a week before going on sale in the shop. This first batch will be on sale as testers, with customers being asked to give feedback. This was on the Wednesday and by Friday the colour had deepened further. If you would like to be among the first to sample our Welsh chorizo come along to Williams and Son butchers, Bangor High Street (Gwynedd), LL57 1PA between Monday and Wednesday this week. Alternately you could book in to our Chorizo special Sunday brunch on Sunday 29th January. Sausage and Chorizo tasters plus a full breakfast for £10 a head. thanks for that write up denise , they are going to be a success .cant wait to hear the feedback .